My kids love black beans. They would eat them just plain in a bowl, and sometimes do! 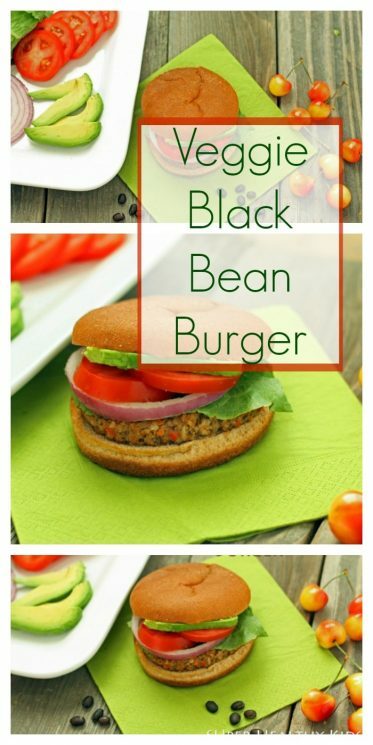 These black bean burgers are a great alternative to regular hamburgers in the summer when you feel like grilling! 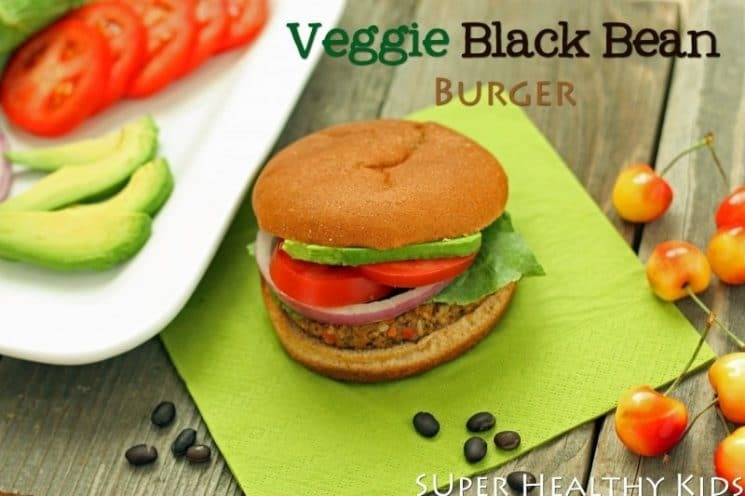 They not only have nutrient packed black beans, but they also have other veggies making them a power house dinner! We love to add lots of veggie fixins’ to them for a complete meal. In a food processor, pulse 1 can of drained black beans until they have broken down a bit. Add your chopped veggies and pulse until diced into small bits. Then add the rest of the ingredients, and pulse until you feel like you have a good consistency and everything is in small uniform pieces. Form them into patties (you will probably want to oil your hands just a bit, because they are pretty sticky) and then lay on wax paper. The trick to these is to freeze them before you cook them. This helps them cook better and makes them less soft. You will want to freeze for about 2 hours or until they are solid. 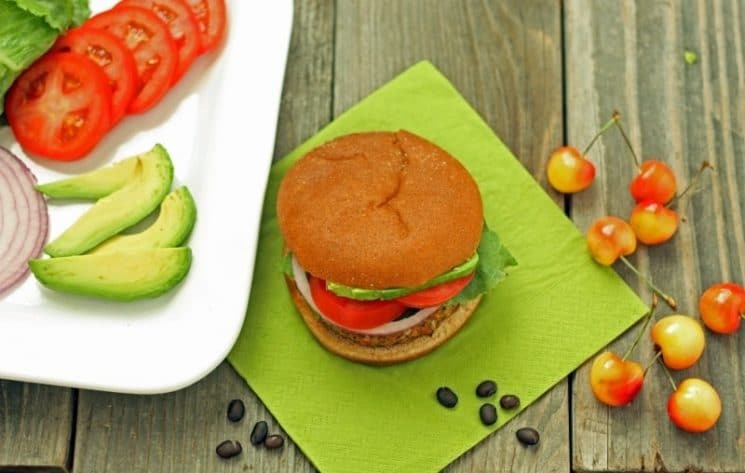 You can freeze the extra black bean burgers for up to 3 months, just store in an airtight freezer container. Grill: Place on a sheet of lightly oiled aluminum foil. Cook over medium-high heat for 7-8 minutes per side. Pan: Lightly oil a skillet and cook on medium heat. Cook 7 minutes on each side. Oven: Preheat oven to 375 degrees. Bake on a lightly oiled baking sheet for 14 minutes. We always make smaller patties also because my kids like them ‘just their size’. 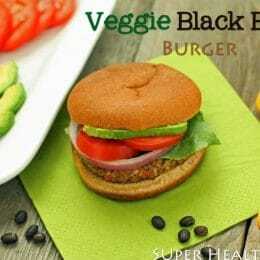 We like our black bean burgers with lettuce, tomato, red onion, avocado, and sometimes a little BBQ sauce. MMMMMM. Serve with a seasonal side of fruit for a balanced summer meal. 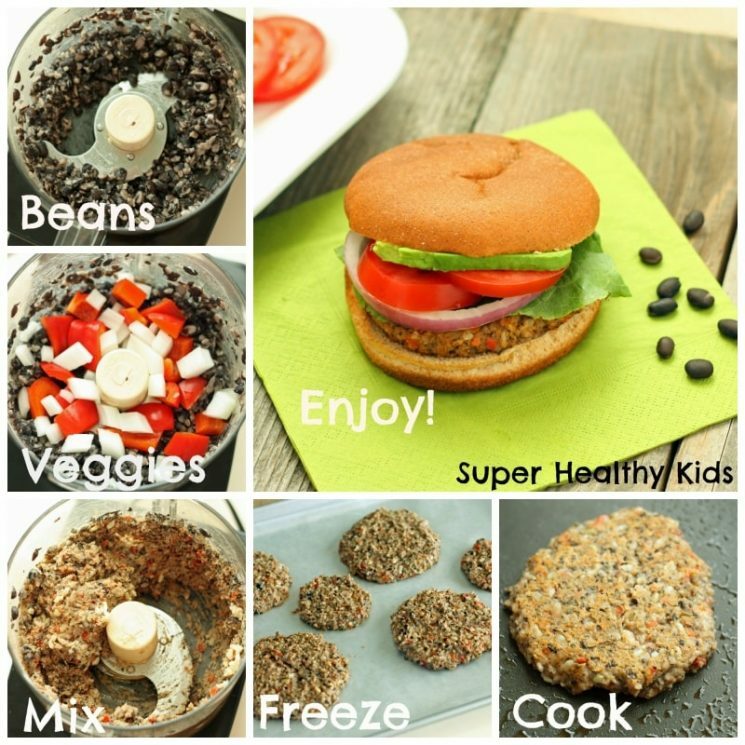 These burgers are great for kids of all ages because they are soft and super easy to chew. Even my 1 year old with no teeth can eat these! Drain and rinse beans. Dry the beans before putting in a food processor. Pulse until slightly mashed. Chop red bell pepper and onion into big pieces. 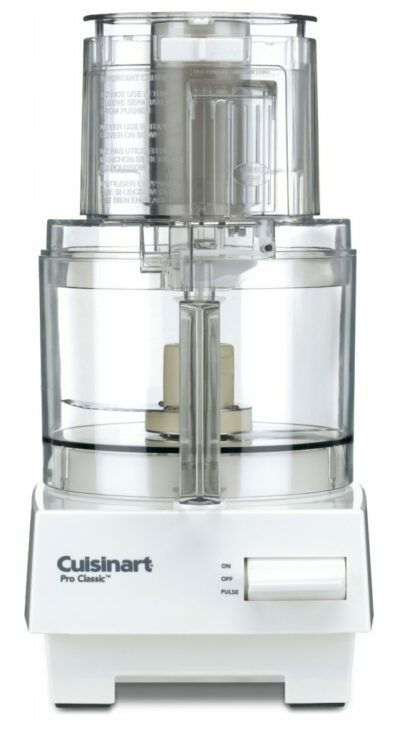 Add to the food processor with garlic. Pulse. Add the remaining ingredients and pulse until well mixed. Form into patties and place on wax paper. Freeze for 2 hours. Place on a sheet of lightly oiled aluminum foil. Cook over medium-high heat for 7-8 minutes per side. Lightly oil a skillet and cook on medium heat. Cook 7 minutes on each side. Preheat oven to 375 degrees. Bake on a lightly oiled baking sheet for 14 minutes. 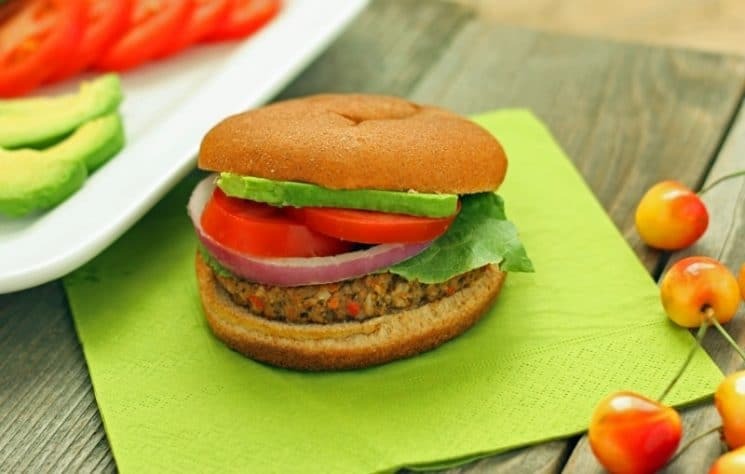 Serve on whole wheat buns with lettuce, tomato, avocado, and any other veggies you like. Could you make these without having to freeze them or does it help keep their form to freeze them? Thanks for all the great ideas, these burgers look delicious! I love this site/IG/FB page! Would oatmeal work for bread crumbs? My daughter is gluten free and I prefer not to buy the gf bread. I often substitute oatmeal in burger recipes for the same reason. If I don’t have any in the house – I just whizz some rolled oats in the blender! Yes you can – they are pretty sticky and a little hard to work with if you don’t freeze them, but you can make it work. They will also need to cook a little longer on the pan. Yes – oats work great. I would pulse in a blender or food processor quick before adding them. Can you use quinoa instead of the brown rice? Thanks for the healthy and delicious recipes. It’s so important to teach our children to eat wholesome food. Can you use dry black beans? How much? What BBQ sauce do you use? All the brands at the store I usually shop have high fructose corn syrup, which I don’t use. How many patties will this recipe make? 4? Thanks! It will make 5 good size patties, and 6 smaller patties. The taste of these were great but mine fell apart while cooking even though I froze first. Any suggestions on how to fix that? Wonder what I did wrong? Still very good! Not healthy to heat aluminum foil . Extremely toxic.